In 2007, an intoxicated Kid Rock got into a fight at an Atlanta restaurant and wound up in jail. In 2013, a woman was arrested for public intoxication at a Loganville, Ga., dining establishment where she mistook a cheeseburger for a shoe and wore it on her foot. And in March, an intoxicated women drove through the front window of a Crestview, Fla., eating house, then staggered inside without pants. Quick—can you name the restaurant where all three of these incidents took place? You probably can if you've ever been south of D.C. with the 3 a.m. munchies and only 10 bucks in your pocket. If so, well, chances are you've staggered into a Waffle House yourself. But Waffle House is no joke. If the legendary Southern chain does not exactly invite drunk people in to order pecan waffles after partying all night, the fact that those doors are open to all helps explain the restaurant's staying power. Waffle House is cheap. Waffle House is tasty. And it is always—no matter what—open for business. Fact: The Federal Emergency Management Agency gauges hurricane damage by surveying how many Waffle Houses are still open in the wake of a storm. Cheap eats and 24-hour diners are nothing new, of course, but Waffle House has won hearts in a way that Denny's and IHOP cannot. It is oblivious to trends, to coolness and to interior decorators. Waffle House is as comfortable and beloved as an old pair of jeans, stains and all. And if there's a bit of a film on the front window, if the pork chop breakfast happens to have 1,030 calories, if that yellow sign looks (as comedian Jim Gaffigan has said) like a ransom note—well, so what? In a place where the coffee's hot, the waitress knows your name, and the hash browns are served eight different ways, it's all part of why you come in. "One of the reasons Waffle House resonates so much with patrons is it's almost like going back in time while eating there," said Lauren Hallow, concept analysis editor for restaurant consultancy Technomic. Waffle House, she added, "really taps into customers' sense of nostalgia because not much has changed over the last 60 or so years, and customers know what to expect when going there." They have since 1955 when Atlanta neighbors Joe Rogers Sr. and Tom Forkner launched an open-kitchen restaurant that was small enough for the grill cooks to converse with patrons as they ate. And, as communications manager Kelly Thrasher points out, the restaurants are still built that way. "The cooks can freely interact with our guests," Thrasher said. "You eat in our kitchen, and this is a welcoming and familiar experience for many." Indeed, modernity is a latecomer to Waffle House (the place only started taking credit cards in 2006), but that seems more a comfort than a shortcoming. "As our regulars know," reads the website, "we don't like to fix what isn't broken." 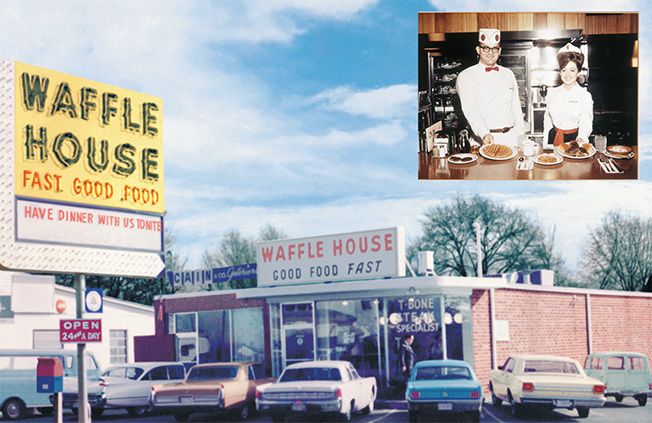 Waffle House's first location, above, opened in the Atlanta suburb of Avondale Estates where the uniforms were white and the smiles genuine (above, inset). Today, the original location houses the Waffle House Museum, open by appointment.